Many parents will call a strong-willed child difficult or stubborn. The truth is that your strong-willed child is essentially difficult and stubborn but these are not negative personality traits. A strong-willed child can really bring so much more to the world if you work to raise them in a positive way. Rather than looking to deter their innate personality as a strong-willed child, learn to embrace this parenthood journey and use these strategies to parent a strong-willed child with success. Gently guide them to use their strong will to have strong morals, endurance, and a sense of right and wrong. Be mindful that your strong-willed child is going to learn best through experiences. This is not the textbook child you read about in your parenting books during pregnancy. A strong-willed child will be that one child who has to taste the salt to realize too much does not taste good. They are not saying they don’t believe or trust you they are saying they have to see for themselves. This is frustrating as a parent, but if you learn to embrace that your strong-willed child must learn through experimental behaviors like this, you’ll be able to reduce your stress and work through these moments. Make sure to have safety measures in place so they do not endanger themselves as they experiment. Your strong-willed child desires to have control of their world Since this child will have that innate desire to have control, you can work activities into their day that give them those moments to be in control. Consider allowing your strong-willed child to have two choices for various activities, lunch choices and clothing options to give them that teeny bit of control they need. Do this in a way that works for you. I always ask my son would you like to leave now or in 10 minutes. He always chooses the 10 minutes and we have a agreement. Since he chose he can not argue about leaving. Not to say it always works but it has reduced some struggles. In the parenting books and everywhere online, you’ll find parents telling you that you are a horrible parent for letting your child go out in the cold winter season without a coat. The funny thing is that if you see a family counselor who specializes in strong-willed children, they’ll tell you natural consequences work best. Allow your child to have authority over their body, such as choosing to wear a coat or not. It’s that child’s body and if they get cold enough, they’ll come asking for a coat. I let my son make the choice and just quietly bring his coat or sneakers with me so when he wants them they are available. 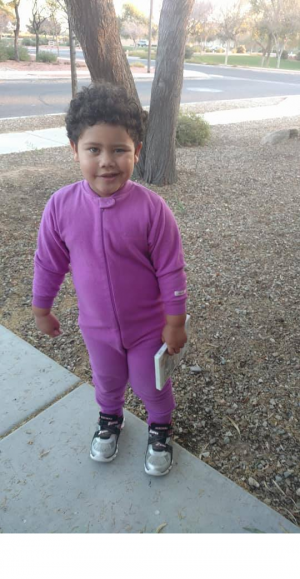 Recently he chose to wear purple footed pajamas to school. We live in AZ and it was 100 degrees out. I warned him he would get hot but let him decide. When pickup happened he was changed into the shorts and t-shirt I had quietly handed his teacher. As parents, we sometimes hover over our child making so many decisions for them instead of allowing them to experience childhood and learn through experiences. When you’re raising a strong-willed child, you have to learn to let it go. Your strong-willed child will argue with you over any situations where they feel they are right and you’re wrong. Allow your child the safe space to experience natural consequences, this will ease your stress and allow your child to have that control to learn on their own. All the tips and strategies in the world are not going to prevent every power struggle. The thing I have found the most helpful when a struggle does occur is to not engage. Tell them in a no nonsense manner that this is how it is and that while you respect their input and understand their frustration it is not up for debate. I like to use love and logic and their sandwich method. Start with a good put the negative in the middle and end with a good. For example I may say Alijah I am so glad that you know what you want but today we are not doing such and such however I really like the idea so maybe a different day. If that does not diffuse him and he has to go to time out I again employ a love and logic method. I say it’s too bad that you decided to have a fit when you chose to calm down you may come out of time out. And then I walk away. I have just left the decision firmly in my strong-willed child’s hand. He knows he is choosing to have a meltdown and when he chooses to stop he is free to go about his day. With a strong-willed child it is all about they want to make a choice. Raising a strong-willed child can be extremely exhausting at times and it’s hard to let go as a parent. The thing is, when you’re raising a strong-willed child, all of those parenting books that were read will go out the window. Strong-willed children, need to learn on their own in an experimental way. One parenting resource I use often is Love and Logic. If you have not taken a course or read one of the books I highly recommend it. It will help you gain resources and a plan on how to best guide your child and still allow them the ability to learn on their own terms. Keep in mind it is not the only resource but it is a great one. As you parent your strong willed child you will learn what works for you and them. It’s your job to develop a parenting plan that keeps them safe from extreme danger while allowing them to experience life and learn from these experiences. I just absorbed this post! I have a strong-willed 3 yr old and every day seems like a struggle. I’ll try some of these tactics. Hopefully things improve. As a mother of an eight year old it’s not always easy. It’s hard when she doesn’t want to wear a sweater in the cold season. I like your tactic of having the extra clothes. I’m not sure if my child is strong willed or just chooses to ignore us and do what he wants. But he’s usually a good listener!! I have a strong-willed 2 yr old and every day seems like a struggle.I think your tips are too useful.This will help me greatly. I’ll try to keep your tips in mind!